Skin aging is an extremely complex process, which basically depends on two factors. Because of this, the skin of different ethnicities ages in its own unique way. Particularly sun sensitive, this type of skin wrinkles quickly, in part because of its weak defences and its metabolism, which quickly destroys the collagen and elastin fibres when under attack. “In this type of pale and relatively young skin, the signs of aging are still quite mild. However, it is vital to adopt a suitable prevention routine, such as treating dehydration with SkinboostersTM and Biostimulation. I also recommend trying to prevent the appearance of wrinkles on the forehead and around the eyes, and fighting against drooping in the eyebrows and the forehead (Restylane® skinboosterTM or Restylane® Refyne & Azzalure®). The aim is to care for the skin as it ages, so that the features do not become deformed. An SPF50 is essential.” Dr Marilyne Plasqui, aesthetic doctor. This type of skin wrinkles very little, and on average looks around ten years younger than Caucasian skin. However, it is extremely sensitive to pollution and tends to mark easily. “Asian skin ages differently, with the appearance of marks and a yellow tinge, a opposed to wrinkles. Rarely dry, usually combination to oily, it often lacks water and radiance, while suffering from pigmentary marks very early on. So, from age 40, you must prevent dehydration and densify the dermis. For a dull and flawed complexion, I recommend a few gentle NeoStrata peels and vitamin-rich mesotherapy. SPF50 is also vital for this type of skin. It can be used alongside a vitamin C-based cosmetic every morning and fruit acids every evening, to recover/ maintain its radiance.” Dr Marilyne Plasqui, aesthetic doctor. This type of skin wrinkles much less than the previous two types, mainly thanks to its natural protection against UV rays. The cells that synthesise melanin in black, mixed-race and olive skin are more active and produce a darker-coloured melanin, a veritable sun shield that preserves the cells. “In a cold and dry climate, like the one we live in, this type of skin suffers from dryness, which it tries to combat by producing more sebum. When it ages, it wrinkles very little, but suffers from ptosis in the cheekbones (going as far as creating jowls) and can also have pigmentation issues. The nasolabial folds and often the expression lines are particularly marked and make the face look tired and bitter, which can be corrected with the help of a few injections (Restylane® LyftTM or Volyme). It is better not to have any aggressive peels or laser treatments on this type of skin, as they can aggravate any pigmentation issues. 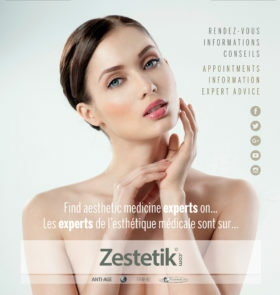 But, above all, this type of skin needs deep hydration with skinboosterTM.” Dr Marilyne Plasqui, aesthetic doctor.